Strategically located less than a kilometre from Sector 62, Radisson Noida lies within minutes of events at India Expo Centre and Mart and shopping hubs like DLF Mall of India and Gardens Galleria. Take a 15-minute taxi ride from the Noida city-centre metro station to reach our hotel situated near major hospitals such as Fortis, Metro, Kailash, Cloud Nine and Max. Corporate travellers are also in close proximity to major global companies like Ericsson, Accenture and Bharat Petroleum. Book an Executive Suite to enjoy a separate living room and an in-room whirlpool. Radisson Noida features three on-site restaurants, all serving creative dishes crafted from fresh, high-quality ingredients. Stop by our pastry shop for an indulgent treat, or invite colleagues to Ethyl Bar for after-work conversation and cocktails. Savour international cuisine for breakfast, lunch and dinner at The Creative Kitchen, located on the lobby level of the Radisson. Head to the rooftop for a wide selection of kababs at The Great Kabab Factory. Feast on hundred-year-old recipes as you take in panoramic views of Noida. Relish the flavourful spices brought in from China and Thailand used to create pan-Asian cuisine at Ni-Hao. Also located on the rooftop, this restaurant offers stunning scenery along with a delectable menu with options like Peking duck with pancake. Akshardham Temple – Also called Swaminarayan Akshardham, this temple is located about 13 kilometres from our hotel and features breathtaking architecture, educational films and exhibits, a boat tour and a musical fountain. National Zoological Park – Situated less than 16 kilometres away from the hotel, this 176-acre zoo provides a home for leopards, elephants, lions, tigers, chimpanzees and rhinoceroses. Pragati Maidan – The largest convention centre in New Delhi, Pragati Maidan lies about 16 kilometres from Radisson Noida and hosts events like the India International Trade Fair and the World Book Fair. 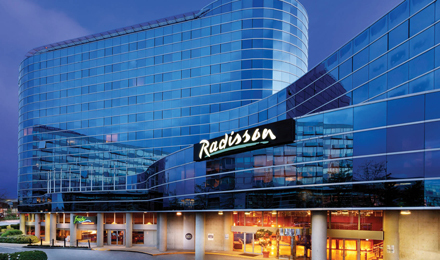 Radisson Noida provides 405 square metres (4,360 square feet) of multipurpose meeting and banqueting space that can be split into four separate ballrooms. The three pre-function rooms include modern office equipment and personalised service. Unwind with free Wi-Fi in NoidaIdeal for both business and leisure travellers, the 88 rooms and suites at Radisson Noida offer modern accommodations with amenities like free high-speed, wireless Internet, LED TVs and iHome docking stations. After a day of on-site meetings, retreat to your room to take advantage of coffee and tea facilities and a minibar with a selection of soft drinks and snacks. If you‘re travelling with family, interconnecting rooms are also available. The beautifully designed Deluxe Room includes a fully equipped washroom with a modern shower cubicle, a spacious work area and free high-speed, wireless Internet. The room is outfitted with personal touches like floral curtains, accented lamp shades and patterened sofa chairs. All standard amenities, such as a minibar, an iHome docking station and a 40-inch LED TV, are included. Premium Rooms feature distinctive modern décor and standard amenities like a fully stocked minibar. Sit back and relax while you enjoy your favourite programme on a 40-inch LED television. Additional features include a welcome drink on arrival, a daily fruit platter by request and your choice of newspaper. Located on the first floor, Executive Rooms at Radisson Noida offer modern amenities and open out to calming views of our beautifully manicured terrace gardens. Gaze at the greenery while enjoying a piece of fresh fruit or relax in the plush lounge chair. Situated on the fourth floor, our Business Class Rooms offer dome-shaped ceilings and panoramic views of the city skyline. Enhance your stay with an LED TV, a lounge chair and a bathroom with a whirlpool. Treat yourself to an Executive Suite, complete with a separate, brightly lit living room and a writing desk that serves as a comfortable work area. These suites also offer the latest high-tech devices, including a 48-inch LED TV in the living room and a 40-inch LED TV in the bedroom. When you’re ready to relax, ease into the whirlpool tub or step into the walk-in shower in the oversized bathroom.